Beautify and adorn your hair with Spellstone hand-carved hair sticks designed for us by Alex Morgan. 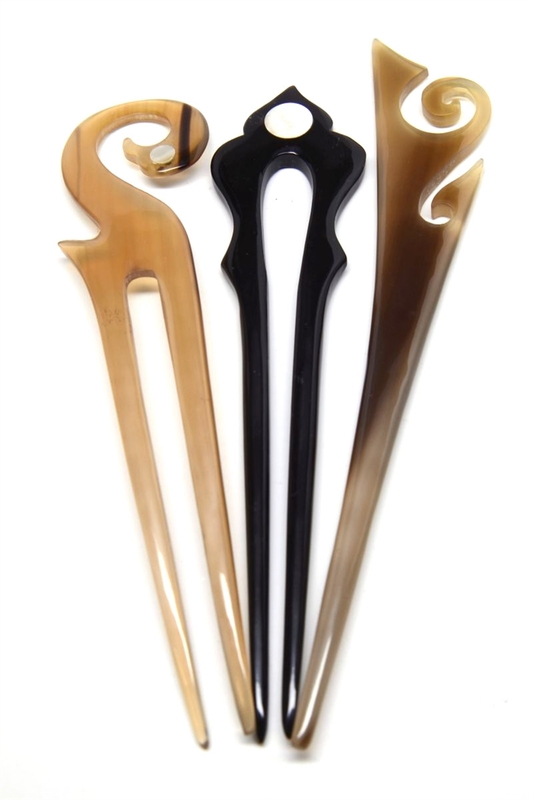 These one and two-tine hairsticks are hand carved in Vietnam of domestic water buffalo horn, some with abalone inlay. 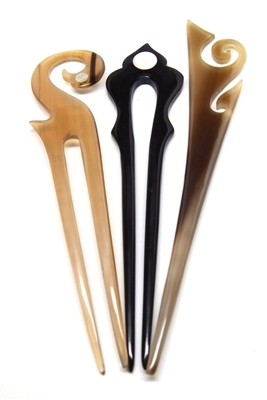 The hair sticks are about 6 1/4 " ( 16 cm) long depending on design. Every one has a blessing implied in the design. They will arrive in a gift box, ready to present to someone you love, or as a gift to yourself for a special occasion. A talisman for artists of every kind. Awen opens the window through which beauty may flow and be shaped by the body as song, dance, art, poetry. The garden of paradise holds peace and abundance, as well as the knowledge of good and evil, wisdom and language. The bud symbolizes the potential for new growth, new wonders, new knowledge. Note: This item is also available in amber-colored buffalo horn. Choose from the dropdown list at the op of the page. Huginn was one of Odin's raven messengers. Odin's ravens carried knowledge from the heavens to earth. Wear Huginn to look at everything around you, consider things carefully, and ponder. Kaie’s Celtic patterns symbolize triumph in the battles of life. These swirls and spurs represent growth, change, successful struggles and accomplishment of difficult endeavors. Keelin’s Celtic patterns symbolize grace and new growth. These positive and negative swirls represent evolving life in balance. Swan gives the ability to see beyond outward appearance to the true beauty within, also, to project your inner light outward. Wear Swan for the grace to accept things as they are. Muninn was one of Odin's raven messengers. Odin's ravens carried knowledge from the heavens to earth. Wear Muninn to gather knowledge from the entire world, and remember. Snakes shed their skin when they have outgrown it. Wear Serpent when you need to slough off the old, outworn modes of being, and display a brand new, revitalized you. Ula’s smiling swirls represent the evolving cycles of life. These swirls map growth, change, new perspective on old issues, and seasons of the year. Bat is reborn each night out of deep caves, and thus symbolizes the initiatory process of symbolic death to the old way of life, and rebirth to the new. The skull is a symbol of the ancestors in many cultures. It provides spiritual protection and wisdom from deep cultural memory. Wyre symbolizes ethereal communication. Wyre brings messages from the subconscious through dreams and daydreams.